Stacked with new faces and talent, the SF State men’s basketball team is eager to take on the new season with hopes of maintaining a winning record. The Gators are coming off a 16-11 season, finishing in fourth place in the California Collegiate Athletic Association after hosting their first ever post-season tournament game. Veterans and head coach Paul Trevor anticipate another successful season with help from recruits, transfers and a new assistant coach. This is Trevor’s second year with the Gators. His passion and enthusiasm for the team is obvious as he speaks fervently about the bond and goals of the team. Alex Pribble is the newest member of Trevor’s staff as this year’s assistant coach. He was the head coach at Tamalpais High School for three years before coming to SF State. He said he is ready to contribute to every player and position on the team. Pribble said his main focus is preparation because college-level play is more competitive. The Division I high-energy games are nothing new to Pribble, who played for four years at UC Berkeley. He hopes to help Trevor and the team exceed higher standards and expectations. “(Pribble) is a big asset to our team,” said Trevor, who added the veterans would play a big part in showing the ropes to the newcomers. Among those returning veterans is Nefi Perdomo, who was last year’s first team all-CCAA performer. As a junior and three-year player for the Gators, Perdomo wants to bring to the team more leadership and a positive attitude every day. Perdomo especially hopes to be a guiding leader to the new Gators, including freshman recruits David Love, Robbie Herndon and Rico Matheny. The SF State Gators also embrace Casey James, James Albright and Griffin Reilly as Division I transfers. 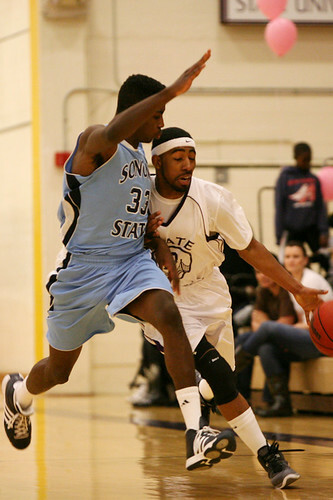 Thomas Nesbitt and Jordan Johnson are two community college transfers who come to SF State this year. Both players aim to hold down the Gator defense, as Johnson is the only center transfer and Nesbitt averages eight rebounds. Reilly, the only senior transfer, hopes to bring leadership to the team. He transferred from Loyola Marymount University, where he played in 22 games. Trevor describes Reilly as a “pure shooter” who is sure to benefit the Gator offense; Reilly has a career high of 29 points. Reilly said the transition onto the team has been cohesive because he came on positive and deferential. Reilly’s ultimate goal is shared among the team, but Trevor knows that progress takes time and patience, two virtues he is willing to adhere to. Trevor said although talent has increased with the team additions, it would take focus and lots of patience to come out on top. The SF State Gators are scheduled to play two exhibition games in the next week, and will start off the regular season Nov. 12 against the Academy of Art University at a two-day tournament. Trevor added that he sees his team getting better and better every day. Perdomo also sees the team’s growth. His personal advances this year include his shooting and overall better play, but basketball is a team effort and he acknowledges the talent his team brings to the court.